Ransomware has recently (re)emerged as a popular malware that targets a wide range of victims - from individual users to corporate ones for monetary gain. Our key observation on the existing ransomware detection mechanisms is that they fail to provide an early warning in real-time which results in irreversible encryption of a significant number of files while the post-encryption techniques (e.g., key extraction, file restoration) suffer from several limitations. Also, the existing detection mechanisms result in high false positives being unable to determine the original intent of file changes, i.e., they fail to distinguish whether a significant change in a file is due to a ransomware encryption or due to a file operation by the user herself (e.g., benign encryption or compression). 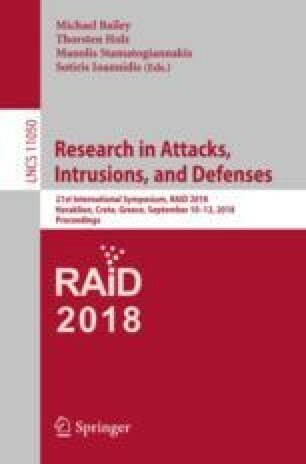 To address these challenges, in this paper, we introduce a ransomware detection mechanism, RWGuard, which is able to detect crypto-ransomware in real-time on a user’s machine by (1) deploying decoy techniques, (2) carefully monitoring both the running processes and the file system for malicious activities, and (3) omitting benign file changes from being flagged through the learning of users’ encryption behavior. We evaluate our system against samples from 14 most prevalent ransomware families to date. Our experiments show that RWGuard is effective in real-time detection of ransomware with zero false negative and negligible false positive (\(\sim \)0.1%) rates while incurring an overhead of only \(\sim \)1.9%. We thank our shepherd, Alina Oprea, and the anonymous reviewers for their valuable suggestions. The work reported in this paper has been supported by the Schlumberger Foundation under the Faculty For The Future (FFTF) Fellowship.